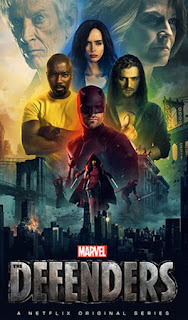 I have been watching the series from Netflix about the Marvel superheroes that consisted of Daredevil, Jessica Jones, Luke Cage, and Iron Fist for a while now and the prospect of having 4 superheroes working together was really exciting. So when I got the chance to see this series during our last weekly weekend staycation, I finished it off very fast, especially since it only had 8 episodes. Well to speed things up, let us get on with the series now. Few months after the events of Daredevil season 2 and Iron Fist season 1, Danny Rand (Finn Jones) and Colleen Wing (Jessica Henwick) were trying to locate the people that could help them expose The Hand which was the organization responsible for the death of Danny's parents. Their journey brought them back to New York where supposedly The Hand had some secret agenda there. Meanwhile Matt Murdock (Charlie Cox) was now concentrating more on his daytime job as lawyer working on pro-bono cases. He was still having mixed feeling on his decision to put off his suit as Daredevil. However, his good friends Foggy (Elden Henson) and Karen (Deborah Ann Woll) were more relieved with such decision. At the other side of the city, Luke Cage (Mike Colter) was just released from jail and he wanted to come back to Harlem and continue watching over the neighborhood. The Harlem detective named Misty Knight (Simone Missick) who cooperated with Luke in the earlier events asked Luke's help on some shady activities involving the young boys of Harlem. Despite a bit of objection from his girlfriend Claire Temple (Rosario Dawson), Luke was still adamant to assist Misty. Finally Jessica Jones (Krysten Ritter) who got a bit of fame due to her previous acts was still reluctant to take on cases for her investigation firm. Her adoptive sister Trish (Rachael Taylor) tried to push Jessica to get back to work which she kept on trying to avoid. That is until one particular case involving a missing architect raised her curiosity. These four heroes would somehow intertwined with one another while trying to resolve each problem/case. Ultimately it would involve the Hand with its leader Alexandra (Sigourney Weaver - Alien quadrology, Avatar, Gorillas in the Mist etc). So how would Daredevil, Iron Fist, Luke Cage and Jessica Jones meet? How could they work together when there was so much difference? And what was the Hand's plan in New York city? Find them all in this very interesting series. Phew this series was totally awesome. The pace was absolutely fast due to having only 8 episodes to wrap up. And since all the heroes have been introduced in his/her own series earlier, there was no introduction necessary for each hero. Hence the series can concentrate on the more important thing which was the case investigation. One thing that I totally enjoyed was the cool way of how each individual hero met the other heroes. The way it was shown was very smooth and logical and was not feel forced. As a series that combined all four superheroes to fight the big bad organization, it certainly did not disappoint. Every hero was able to show his/her own strength and also the weakness (if you consider it as weakness) but ultimately the wonderful thing was how all managed to cooperate and work together despite their obvious differences. The series was also full of fighting and action sequence with the climax scene in the last episode amazingly done. In addition to the fight and action sequence, the series also got quite few surprises and twists and it literally make you could not stop watching. It was a good thing that it only lasted 8 episodes so it can be finished quite fast (you could imagine if it's 16 or even > 20 episodes). Now I realized that when you combine four superheroes into 1 show, there would obviously be 1 or 2 favorites of yours. For me I think the four of them were really my favorite. I loved how good of a fighter Daredevil and Iron Fist were, and how strong (and funny in a dark way) Jessica Jones was and how indestructible Luke Cage was. But if I have to make a choice of my most favorite, it would definitely be Matt Murdock aka Daredevil who had to face not 1 but 2 people from his past (and obviously the thing involving him in the final episode). As a conclusion, I really really would recommend you to watch this series but definitely you must watch ALL the previous series of each heroes (total 5 seasons) first. I am not sure whether there would be a second season of this series, but if there is, I truly cannot wait for it to show. Sadly though, I do not think it will happen in 1 year time, perhaps only in 2 or maybe even 3 years. This would be worse than the wait for final season of Game of Thrones which would only be shown in 2019. Ooh 1 personal note from me, do not believe all the people that said Iron Fist was bad or whatever, coz I think he was OK in this (have to remember that his personality was just a boy who had to take on a large responsibility). On that note, I leave it to you to decide when you would watch this series.